Lobsters could soon be "crusta-stunned" to death, if an invention by a British barrister takes off. Simon Buckhaven says his electronic stun-gun would be a humane way of killing the creatures. He has worked for two years with scientists from the University of Bristol to make the Crusta-stun and has estimated its cost at up to £2,000. 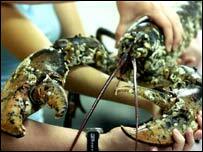 Currently most lobsters are either drowned in fresh water or stabbed before being cooked. Mr Buckhaven told BBC News the new device conformed with slaughter regulations applied to animals such as cows or sheep. He said: "In a fraction of a second it knocks them unconscious and then, by the sustaining of the current, it destroys the entire nervous system, which kills them." Last year Mr Buckhaven told a parliamentary select committee that workers in the fishing industry would be able to afford the stun-gun. "Until now there has been no electronic method of dealing with crabs, lobsters and crayfish. We have it now. We know it works," he said at the time. "When the question of cost has been raised, the shellfish producers in Cornwall think it is very viable in terms of the equipment they have to use." On the BBC Food website, Lloyd Burgess from Masterchef has argued that freezing lobsters is a humane alternative. In his recipe for Lobster Fricassee, he said: "Live lobsters can be humanely killed by putting them in a plastic bag in the freezer for about two hours. They slowly lose consciousness and die."